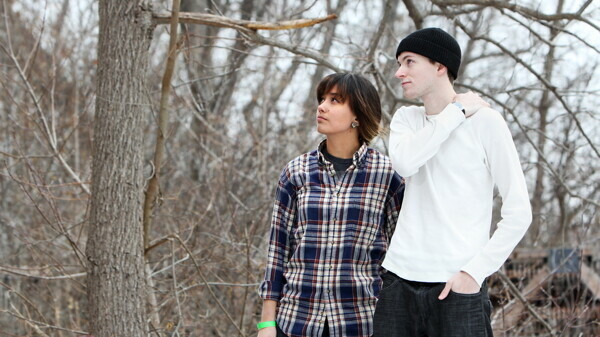 Written By Daniel (aka Daniel Johnson) and vocalist Koryna Flores, shown here enjoying some trees. Johnson ‘s upROOTED album juxtaposes nature and technology. Written By Daniel’s freshman album, upROOTED, features a fresh perspective not heard on the overwhelming majority of hip-hop albums: the third person. While much of hip-hop uses the first-person “this is how I’m living”-style in its lyricism, it was important for Daniel Johnson of Written By Daniel to tell a story. The basic narrative of upROOTED is about a young protester going to the woods for a demonstration with an arsenal of technology to pass the time. The main crux of the story is the juxtaposition of nature and technology. In upROOTED, the two are not opposed to one another as they are in most pastoral literature, both classic and modern. The fact that upROOTED has an interesting story isn’t the only thing that makes it unique. The album also features lush instrumentation, a rarity in the Eau Claire hip hop scene. Johnson says he wanted to use live instruments on the album because he saw the story as a folk tale, and live instruments reinforced that aesthetic. Johnson recorded the album with Evan Middlesworth at Pine Hollow Studios outside Eau Claire. Using a professional recording studio like this was a first for Johnson, who has recorded much of his previous work in his home. The beats are often dark, but lush with layers of instrumentation that follows the story and they flow from one song to the next as Written By Daniel describes the journey his main character takes. The mix of live instrumentation and samples shows on stand-out tracks like “Chains,” which has an eerie vocal track backing the heavy synth and light drums or on “eHarmony,” which has an epic melody that Written By Daniel lays his vocals over. According to Johnson, working with Middlesworth really helped the album come together. upROOTED is available now at WrittenByDaniel.bandcamp.com as a pay-what-you-want download.